Click here for detailed leather back arm chair plans. 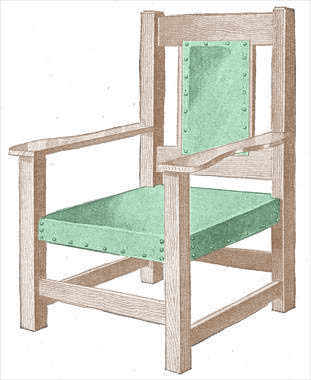 Quarter-sawed oak is the wood most generally used. The stock can be ordered from the mill, cut to length, squared and sanded. 2 front legs, 2 by 2 by 26-3/4 in. 2 back legs, 2 by 4 by 43 in. 2 arm rests, 1 by 4 by 26 in. 5 rails, 3/4 by 4 by 21-1/2 in. 5 rails, 3/4 by 2 by 2-1/2 in. .
2 back pieces, 3/4 by 2 by 16-1/2 in. 1 piece leather, 31 in, square. 1 piece burlap, 28 in, square. 2 pieces leather, 13 by 18 in. 2 pieces burlap, 13 by 18 in. 1 box 8 oz. tacks. Start with the front legs. Cut a tenon 1-1/4 in. square and 3/4 in, long on one end to fit the arm rests. The mortises for the side rails are cut 1/2 in. wide and 7/8 in, deep. The tenons on the rails are cut to fit these mortises, care being taken to get them all the same length between shoulders. The back legs are cut with an offset of 2 in. as shown in the detail drawing and also have mortises cut in them for the back crosspieces. The upright pieces in the back are fastened into the crosspieces by means of tenons and mortises, and should be in place when the crosspieces are fastened to the legs. The arms are cut from the 1 by 4 by 26-in. pieces. Be careful to get them so they will pair. The outside edge can be either curved or straight as desired. The front ends of the arms are held in place by mortises which fit over the tenons on the ends of the front legs, while the back ends are held in place by round-headed screws as shown. The chair is now ready to be glued. Be sure to get the parts together perfectly square, and when dry scrape off all surplus glue around the joints, for stain will not adhere to glue and a white spot will be the result of failing to remove it. Go over the parts carefully with fine sandpaper and remove all rough marks. Then apply the stain you wish to use. To make the seat, first fit boards in the bottom and nail them to the side rails as shown. Fill the space with hair or elastic cotton felt to about 3 in. above the edge of the rails. Bind this down tightly with a piece of burlap and tack the edges to the rails. Cut out the corners of the burlap so that it will fit about the posts. Put the leather on over this and tack the edges to the bottoms of the rails. Then finish with the ornamental nails as shown. To finish the back, first tack a piece of burlap over the opening, then place a layer of hair or cotton felt on this about 1 in. thick. Stretch the leather over this and fasten with ornamental nails. The back side is finished in the same manner, except that the hair is omitted.